Prince William is sure to be a hands on kind of Dad. 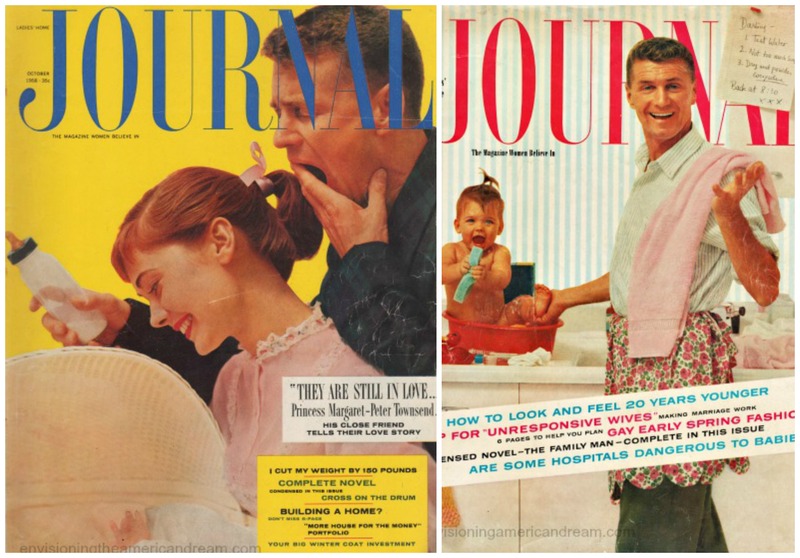 Today’s Dads are much more engaged and involved in their baby’s birth and care than fathers from previous generations who were generally pictured as bumbling fools when it came to babies. 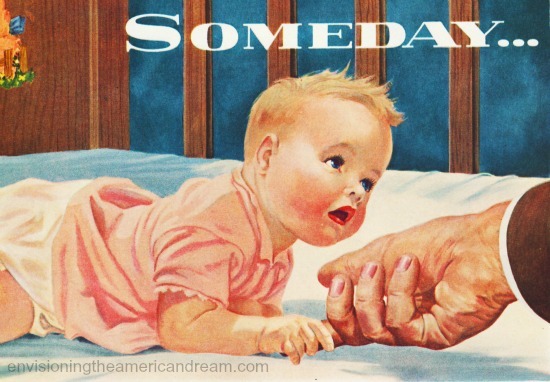 My Dad, like many mid-century Dads, had been left out in the cold during most of the pregnancy. Even though Togetherness was the decades foolproof formula for family fun and fellowship, the warm and fuzzy tableau of togetherness didn’t get all tangled up with the messy business of birth. 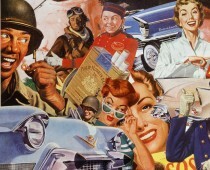 Not withstanding the fact that Madison Avenue had become enamored with the idea of an entirely new type of fatherhood, portraying snappy pappy’s not just behind the wheel of a new Buick but behind a baby stroller, real-life fathers were still kind of an after thought when it came to babies. 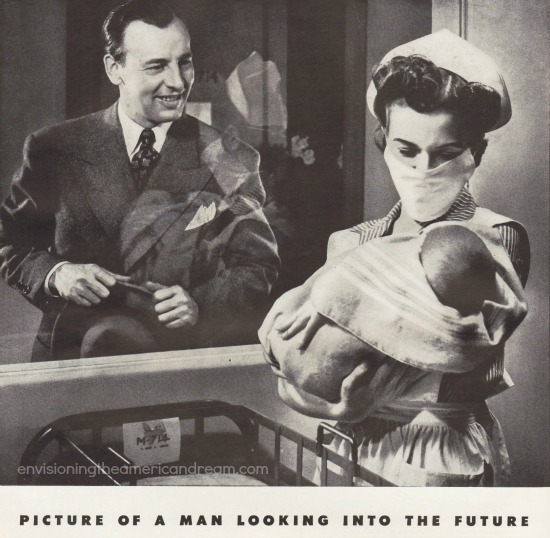 In the hospital if my father had wanted to see his baby, he had to stand outside a nursery window, tap on the plate glass and look beseechingly at the night nurse. Squinting through her coke bottle glasses, she would then check my tiny name bracelet made up of pink plastic beads, scoop me up as I snuggled into her thick white sweater and bring me over for a viewing through the window while Dad waved. Of course he knew the hospital was right in guarding his baby and all the others from any outside germs. But he would make up for that- he wanted to be a new kinda dad -a hands on kinda dad, transforming into the very model of togetherness. My father may have said he wanted to be hands on kinda Dad but it was my Mother who had her hands filled. Once the the baby nurse was gone, Moms diaper decorated world kept her too busy for words. There was no time to flip through a magazine, talk on the phone or even open a newspaper to keep up with the news, let alone get her hair done, or shop. Spare time with a new baby in the house? And a toddler? Fuhhgedaboutitt! Sometimes, she joked, she felt like a contestant on the $64,000 Question, sequestered in one of those isolation booths, cut off from the world. But coming to Mothers rescue was the new kinda Dad. 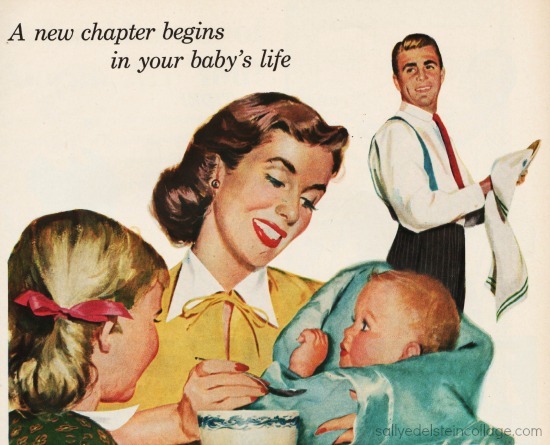 American Dads coast to coast were getting involved in child care, a trend so remarkable Life Magazine gushed enthusiastically on the phenomenon, calling the New American Domesticated Male the greatest advances in parenting. Of course, Spock made it abundantly clear, he didn’t mean that the father had to give just as many bottles or change just as many diapers as mother. But it’s okay for the big brute to do these things occasionally. Togetherness was fine as long as it fit father’s timetable. Unlike Mom, in Dads version of togetherness, tedious, time consuming tasks were optional, picking and choosing chores like it was some sort of Chinese Menu, taking a time-out when ever he wanted. “Madam! 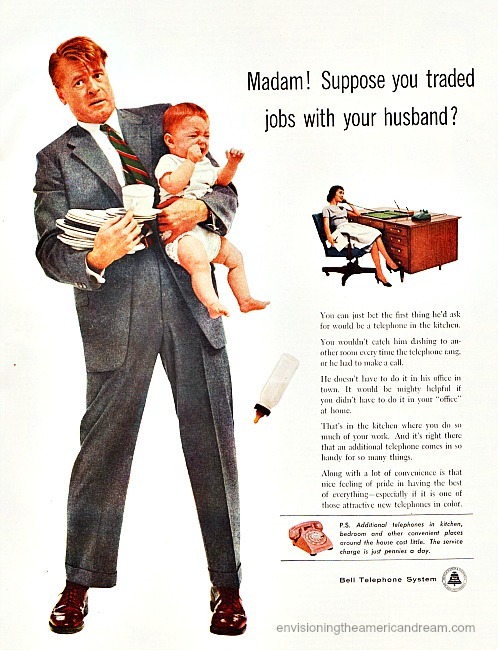 Suppose you traded jobs with your husband?” this vintage ad from Bell telephone asks. At a time when most families had one phone, the addition of a kitchen phone was a luxury, but soon became a necessity in the sprawling suburbs. Preparing my bottles appealed to the master mixologist in Dad, so Sunday mornings became his day for making the formula. Since he knew a thing or two about mixing a mean martini- he applied the same skills in making my bottles. Fumbling around like the sorcerers apprentice he sterilized, measured and capped in great clouds of steam, mixing enough bottles for round the clock imbibing. His motto- keep ‘em clean and keep ‘em generous. However when he decided to streamline the preparation using a cocktail shaker, his bottle tending license was quickly revoked. 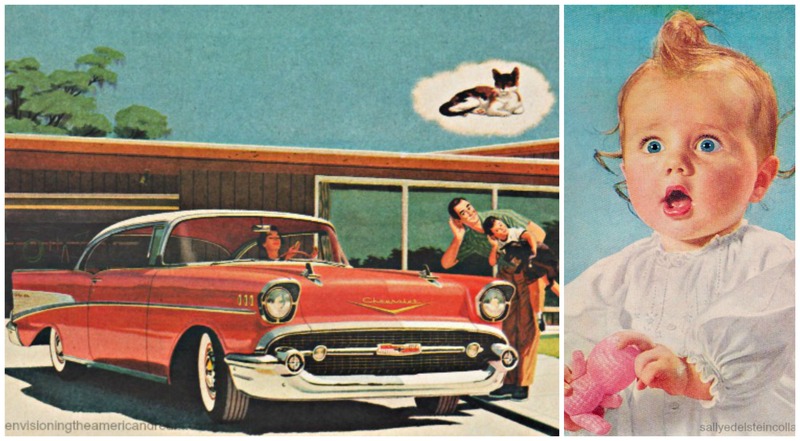 In the weeks to come, my snapshot totin’-puffed- up- proud papa would chew the ears off the boys in the office with his gloating, but you never could be sure if he was swooning over his new two- toned ‘55 Chevy… or me. “You’ve never seen its equal”, he boasted, “This is a masterpiece of design” he would crow, remarking on the fine workmanship and ease of handling. “Of course,” he’d chuckle, “she’s born of a team of great engineering! And just check the chassis,” he’d brag, flashing the Brownie snapshots around. “She sure looks like a honey to handle” they all agreed.